In cosmology, the cosmological constant (usually denoted by the Greek capital letter lambda: Λ) is the energy density of space, or vacuum energy, that arises in Albert Einstein's field equations of general relativity. It is closely associated to the concepts of dark energy and quintessence. Einstein originally introduced the concept in 1917  to counterbalance the effects of gravity and achieve a static universe, a notion which was the accepted view at the time. Einstein abandoned the concept in 1931 after Hubble's discovery of the expanding universe. From the 1930s until the late 1990s, most physicists assumed the cosmological constant to be equal to zero. 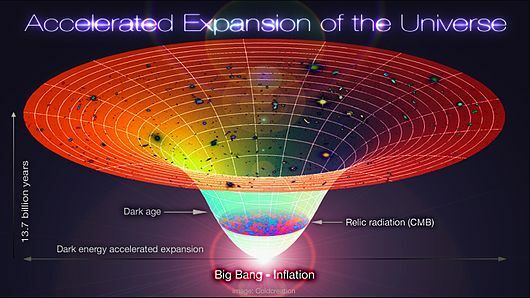 That changed with the surprising discovery in 1998 that the expansion of the universe is accelerating, implying the possibility of a positive nonzero value for the cosmological constant. Since the 1990s, studies have shown that around 68% of the mass–energy density of the universe can be attributed to so-called dark energy. The cosmological constant Λ is the simplest possible explanation for dark energy, and is used in the current standard model of cosmology known as the ΛCDM model. 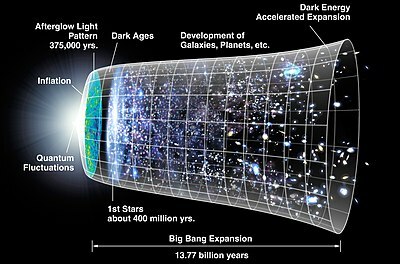 While dark energy is poorly understood at a fundamental level, the main required properties of dark energy are that it functions as a type of anti-gravity, it dilutes much more slowly than matter as the universe expands, and it clusters much more weakly than matter, or perhaps not at all. According to quantum field theory (QFT) which underlies modern particle physics, empty space is defined by the vacuum state which is a collection of quantum fields. All these quantum fields exhibit fluctuations in their ground state (lowest energy density) arising from the zero-point energy present everywhere in space. These zero-point fluctuations should act as a contribution to the cosmological constant Λ, but when calculations are performed these fluctuations give rise to an enormous vacuum energy. The discrepancy between theorized vacuum energy from QFT and observed vacuum energy from cosmology is a source of major contention, with the values predicted exceeding observation by some 120 orders of magnitude, a discrepancy that has been called "the worst theoretical prediction in the history of physics!". This issue is called the cosmological constant problem and it is one of the greatest unsolved mysteries in science with many physicists believing that "the vacuum holds the key to a full understanding of nature". Einstein included the cosmological constant as a term in his field equations for general relativity because he was dissatisfied that otherwise his equations did not allow, apparently, for a static universe: gravity would cause a universe that was initially at dynamic equilibrium to contract. To counteract this possibility, Einstein added the cosmological constant. However, soon after Einstein developed his static theory, observations by Edwin Hubble indicated that the universe appears to be expanding; this was consistent with a cosmological solution to the original general relativity equations that had been found by the mathematician Friedmann, working on the Einstein equations of general relativity. Einstein reportedly referred to his failure to accept the validation of his equations—when they had predicted the expansion of the universe in theory, before it was demonstrated in observation of the cosmological redshift—as his "biggest blunder". In fact, adding the cosmological constant to Einstein's equations does not lead to a static universe at equilibrium because the equilibrium is unstable: if the universe expands slightly, then the expansion releases vacuum energy, which causes yet more expansion. Likewise, a universe that contracts slightly will continue contracting. However, the cosmological constant remained a subject of theoretical and empirical interest. Empirically, the onslaught of cosmological data in the past decades strongly suggests that our universe has a positive cosmological constant. The explanation of this small but positive value is an outstanding theoretical challenge, the so-called cosmological constant problem. Another ratio that is used by scientists is the equation of state, usually denoted w, which is the ratio of pressure that dark energy puts on the universe to the energy per unit volume. This ratio is w = −1 for a true cosmological constant, and is generally different for alternative time-varying forms of vacuum energy such as quintessence. The Planck Collaboration (2018) has measured w = 2999897200000000000♠−1.028±0.032, consistent with 2999900000000000000♠−1, assuming no evolution in w over cosmic time. , or 10−47 GeV4, 10−29 g/cm3 in other unit systems. Why does the zero-point energy of the quantum vacuum not cause a large cosmological constant? What cancels it out? in reduced Planck unit). As noted above, the measured cosmological constant is smaller than this by a factor of ~10−120. This discrepancy has been called "the worst theoretical prediction in the history of physics!". ^ Λ is evaluated as 3 (H0/c)2 ΩΛ. ^ Rugh & Zinkernagel (2001), p. ? Baker, J. C.; Grainge, K.; Hobson, M.P. ; Jones, M.E. ; Kneissl, R.; Lasenby, A.N. ; O'Sullivan, C.M. M.; Pooley, G.; Rocha, G.; Saunders, R.; Scott, P.F. ; Waldram, E.M.; et al. (1999). "Detection of cosmic microwave background structure in a second field with the Cosmic Anisotropy Telescope". Monthly Notices of the Royal Astronomical Society. 308 (4): 1173–1178. arXiv:astro-ph/9904415. Bibcode:1999MNRAS.308.1173B. doi:10.1046/j.1365-8711.1999.02829.x. ISSN 0035-8711. Dyson, L.; Kleban, M.; Susskind, L. (2002). "Disturbing Implications of a Cosmological Constant". Journal of High Energy Physics. 2002 (10): 011. arXiv:hep-th/0208013. Bibcode:2002JHEP...10..011D. doi:10.1088/1126-6708/2002/10/011. ISSN 1029-8479. Einstein, A. (1917). "Kosmologische Betrachtungen zur allgemeinen Relativitätstheorie". Sitzungsberichte der Königlich Preußischen Akademie der Wissenschaften. Berlin, DE. part 1: 142–152. Bibcode:1917SPAW.......142E. Gamow, G. (1956). "The evolutionary universe". Scientific American. 195 (3): 136–156. Bibcode:1956SciAm.195c.136G. doi:10.1038/scientificamerican0956-136. JSTOR 24941749. Gamow, G. (1970). My World Line: An informal autobiography. New York, NY: Viking Press. ISBN 978-0-670-50376-6. LCCN 79094855. OCLC 70097. Perlmutter, S.; Aldering, G.; Valle, M. Della; Deustua, S.; Ellis, R.S. ; Fabbro, S.; Fruchter, A.; Goldhaber, G.; Groom, D.E. ; Hook, I.M. ; Kim, A.G.; Kim, M.Y. ; Knop, R. A.; Lidman, C.; McMahon, R.G. ; Nugent, P.; Pain, R.; Panagia, N.; Pennypacker, C. R.; Ruiz-Lapuente, P.; Schaefer, B.; Walton, N. (1998). "Discovery of a supernova explosion at half the age of the Universe". Nature. 391 (6662): 51–54. arXiv:astro-ph/9712212. Bibcode:1998Natur.391...51P. doi:10.1038/34124. ISSN 0028-0836. Perlmutter, S.; Aldering, G.; Goldhaber, G.; Knop, R.A.; Nugent, P.; Castro, P.G. ; Deustua, S.; Fabbro, S.; Goobar, A.; Groom, D.E. ; Hook, I.M. ; Kim, A.G.; Kim, M.Y. ; Lee, J.C.; Nunes, N.J.; Pain, R.; Pennypacker, C.R. ; Quimby, R.; Lidman, C.; Ellis, R.S. ; Irwin, M.; McMahon, R.G. ; Ruiz‐Lapuente, P.; Walton, N.; Schaefer, B.; Boyle, B.J. ; Filippenko, A.V. ; Matheson, T.; Fruchter, A.S.; Panagia, N.; Newberg, H.J.M. ; Couch, W.J. ; The Supernova Cosmology Project (1999). "Measurements of Ω and Λ from 42 high-redshift supernovae". The Astrophysical Journal. 517 (2): 565–586. arXiv:astro-ph/9812133. Bibcode:1999ApJ...517..565P. doi:10.1086/307221. ISSN 0004-637X. Riess, A.G.; Filippenko, A.V. ; Challis, P.; Clocchiatti, A.; Diercks, A.; Garnavich, P.M.; Gilliland, R.L. ; Hogan, C.J. ; Jha, S.; Kirshner, R.P. ; Leibundgut, B.; Phillips, M.M. ; Reiss, D.; Schmidt, B.P. ; Schommer, R.A.; Smith, R.C. ; Spyromilio, J.; Stubbs, C.; Suntzeff, N.B. ; Tonry, J. (1998). "Observational Evidence from Supernovae for an Accelerating Universe and a Cosmological Constant". The Astronomical Journal. 116 (3): 1009–1038. arXiv:astro-ph/9805201. Bibcode:1998AJ....116.1009R. doi:10.1086/300499. ISSN 0004-6256. Schmidt, B.P. ; Suntzeff, N.B. ; Phillips, M.M. ; Schommer, R.A.; Clocchiatti, A.; Kirshner, R.P. ; Garnavich, P.; Challis, P.; Leibundgut, B.; Spyromilio, J.; Riess, A.G.; Filippenko, A.V. ; Hamuy, M.; Smith, R. C.; Hogan, C.; Stubbs, C.; Diercks, A.; Reiss, D.; Gilliland, R.; Tonry, J.; Maza, J.; Dressler, A.; Walsh, J.; Ciardullo, R. (1998). "The High-Z Supernova Search: Measuring Cosmic Deceleration and Global Curvature of the Universe Using Type Ia Supernovae". The Astrophysical Journal. 507 (1): 46–63. arXiv:astro-ph/9805200. Bibcode:1998ApJ...507...46S. doi:10.1086/306308. ISSN 0004-637X. The Planck Collaboration (2016). "Planck 2015 results I. Overview of products and scientific results". Astronomy & Astrophysics. 594: A1. arXiv:1502.01582. Bibcode:2016A&A...594A...1P. doi:10.1051/0004-6361/201527101. Planck Collaboration (2016). "Planck 2015 results. XIII. Cosmological parameters". Astronomy & Astrophysics. 594: A13. arXiv:1502.01589. Bibcode:2016A&A...594A..13P. doi:10.1051/0004-6361/201525830. ISSN 0004-6361. The Planck Collaboration (2018). "Planck 2018 results. VI. Cosmological parameters". arXiv:1807.06209. Bibcode:2018arXiv180706209P. Weinberg, S. (1987). "Anthropic Bound on the Cosmological Constant". Phys. Rev. Lett. 59 (22): 2607–2610. Bibcode:1987PhRvL..59.2607W. doi:10.1103/PhysRevLett.59.2607. PMID 10035596. Abbott, Larry (1988). "The Mystery of the Cosmological Constant" (PDF). Scientific American. 258 (5): 106–113. Bibcode:1988SciAm.258e.106A. doi:10.1038/scientificamerican0588-106. ISSN 0036-8733. Barrow, J. D.; Webb, J. K. (2005). "Inconstant Constants" (PDF). Scientific American. 292 (6): 56–63. Bibcode:2005SciAm.292f..56B. doi:10.1038/scientificamerican0605-56. ISSN 0036-8733. PMID 15934653. Brumfiel, G. (2007). "A constant problem" (PDF). Nature. 448 (7151): 245–248. Bibcode:2007Natur.448..245B. doi:10.1038/448245a. ISSN 0028-0836. PMID 17637631. Davies, P. C. W. (1985). Superforce: The Search for a Grand Unified Theory of Nature. New York: Simon and Schuster. ISBN 978-0-671-47685-4. LCCN 84005473. OCLC 12397205. Hogan, J. (2007). "Welcome to the dark side" (PDF). Nature. 448 (7151): 240–245. Bibcode:2007Natur.448..240H. doi:10.1038/448240a. ISSN 0028-0836. PMID 17637630. O'Raifeartaigh, C.; Mitton, S. (2018). "Einstein's "biggest blunder" - interrogating the legend". Physics in Perspective. 20 (4): 318–341. arXiv:1804.06768. doi:10.1007/s00016-018-0228-9. Redd, N. T. (2013). "What is Dark Energy?". space.com. Archived from the original on 19 May 2016. Rosen, R. J. (2013). "Einstein Likely Never Said One of His Most Oft-Quoted Phrases". theatlantic.com. The Atlantic. Archived from the original on 10 Aug 2013. Barrow, J. D.; Shaw, D. J. (2011). "The value of the cosmological constant". General Relativity and Gravitation. 43 (10): 2555–2560. arXiv:1105.3105. Bibcode:2011GReGr..43.2555B. doi:10.1007/s10714-011-1199-1. ISSN 0001-7701. Caldwell, R. R. (2002). "A phantom menace? Cosmological consequences of a dark energy component with super-negative equation of state". Physics Letters B. 545 (1–2): 23–29. arXiv:astro-ph/9908168. Bibcode:2002PhLB..545...23C. doi:10.1016/S0370-2693(02)02589-3. ISSN 0370-2693. Carroll, S. M.; Press, W. H.; Turner, E. L. (1992). "The Cosmological Constant" (PDF). Annual Review of Astronomy and Astrophysics. 30 (1): 499–542. Bibcode:1992ARA&A..30..499C. doi:10.1146/annurev.aa.30.090192.002435. ISSN 0066-4146. Hobson, M. P.; Efstathiou, G. P.; Lasenby, A. N. (2006). General Relativity: An Introduction for Physicists (2014 ed.). Cambridge: Cambridge University Press. ISBN 978-0-521-82951-9. LCCN 2006277059. OCLC 903178203. Joyce, A.; Jain, B.; Khoury, J.; Trodden, M. (2015). "Beyond the cosmological standard model". Physics Reports. 568: 1–98. arXiv:1407.0059. Bibcode:2015PhR...568....1J. doi:10.1016/j.physrep.2014.12.002. ISSN 0370-1573. Peebles, P. J. E.; Ratra, B. (2003). "The Cosmological Constant and Dark Energy". Reviews of Modern Physics. 75 (2): 559–606. arXiv:astro-ph/0207347. Bibcode:2003RvMP...75..559P. doi:10.1103/RevModPhys.75.559. ISSN 0034-6861. Rugh, S; Zinkernagel, H. (2001). "The Quantum Vacuum and the Cosmological Constant Problem". Studies in History and Philosophy of Modern Physics. 33 (4): 663–705. arXiv:hep-th/0012253. Bibcode:2002SHPMP..33..663R. doi:10.1016/S1355-2198(02)00033-3. Ryden, B. S. (2003). Introduction to Cosmology. San Francisco: Addison-Wesley. ISBN 978-0-8053-8912-8. LCCN 2002013176. OCLC 50478401. Vilenkin, A. (2006). Many worlds in one: The Search For Other Universes. New York: Hill and Wang. ISBN 978-0-8090-9523-0. LCCN 2005027057. OCLC 799428013. Weinberg, S. (1989). "The Cosmological Constant Problem" (PDF). Reviews of Modern Physics. 61 (1): 1–23. Bibcode:1989RvMP...61....1W. doi:10.1103/RevModPhys.61.1. hdl:2152/61094. ISSN 0034-6861. Weinberg, S. (1992). Dreams of a Final Theory: The Scientist's Search for the Ultimate Laws of Nature. New York: Pantheon Books. ISBN 978-0-679-74408-5. LCCN 93030534. OCLC 319776354. Weinberg, S. (2015). Lectures on Quantum Mechanics (2nd ed.). Cambridge: Cambridge University Press. ISBN 978-1-107-11166-0. LCCN 2015021123. OCLC 910664598.